Blowout Sale! 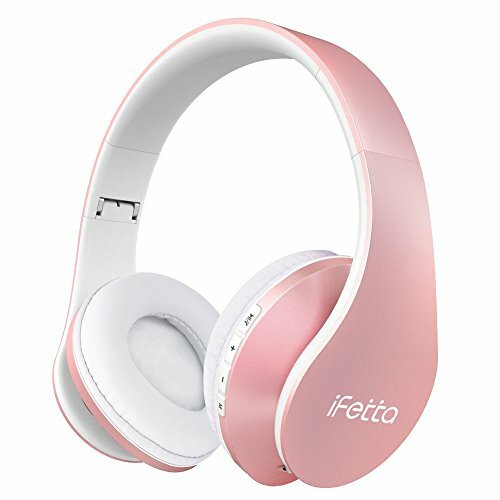 Save 78% on the Ifecco Bluetooth Headphones, 4 in 1 Upgrade Bluetooth Foldable Over-ear Headsets with Micro Support SD/TF Card for Bluetooth-enabled Devices (Rose Gold) by ifecco at B Bluetooth. MPN: FBA_4330345946. Hurry! Limited time offer. Offer valid only while supplies last. Features Wired headphone function Connected via wired function with a line to headphone audio jack. Then you will hear songs from other devices. Connected via wired function with a line to headphone audio jack. Then you will hear songs from other devices. Based on ergonomic design, head beam made of genuine leather, providing comfortable wearing-on experience. Built-in rechargeable lithium-polymer battery ,charging when the red light, about 2-3 hours can be filled with, Full red light , 6-8 hours of continuous use. Multi-Functions: headphones have several options for listening enjoyment. Built in FM radio and you can use a TF/Micro SD card with loaded MP3 music and listen to the songs directly on your headphones. 3.5 mm Port for wired usage. Foldable Design: headphones feature a on-ear foldable design, save more space when on storage. The headphones are extendable to fit many sizes of heads. headphones are very comfortable and fit head very nicely. Wireless & Wired Function: The headphone can be used as wired via 3.5mm plug port. Wireless can be connected via bluetooth connection. If you have any questions about this product by ifecco, contact us by completing and submitting the form below. If you are looking for a specif part number, please include it with your message.